Yadav clarified later saying it was a mere 'joke' and that his intentions were not to hurt the Chief Minister while Raje insisted that such language will set a bad example for youngsters. 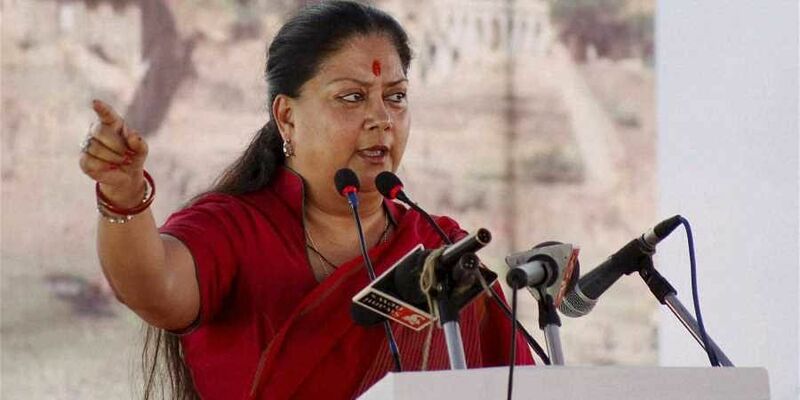 JAIPUR: Rajasthan Chief Minister Vasundhara Raje on Friday demanded action against former JD(U) leader Sharad Yadav for body shaming her during an election rally, saying she felt insulted by his comments and the Election Commission must take cognisance. "I feel insulted. This is the insult of women," Raje told reporters in Jhalawar, adding that she was "absolutely shocked" and did not expect such a comment from an experienced leader. Raje, who is fighting for another term in office, said the leader who had close relations with her family could not control his language. Yadav on Thursday clarified while talking to ANI that his comment was meant to be a joke. "It was a joke. I have known her for a long time. It was in no manner a derogatory remark. I didn't say it to hurt her. When I met her then also I told her that she is gaining weight," he said. Yadav was campaigning for the Loktantrik Janata Dal in Alwar district's Mundwar constituency, one of the five seats where the Congress has entered into an alliance with various parties. Raje's sharp response to Yadav's remarks came on a day the state is voting for a new assembly.